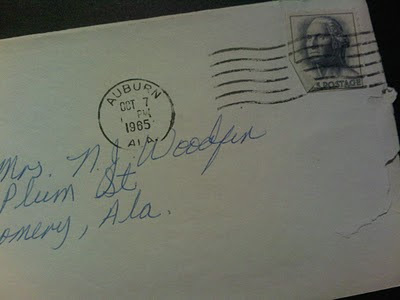 Sometime after my grandfather passed away years ago, my mother discovered a big stack of personal letters he had kept. 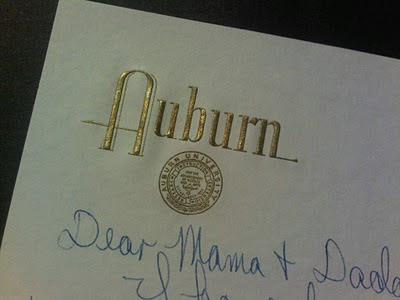 They were written from my mother, to her parents, while she was in college at Auburn University. Forty-five years ago. My mom and my dad had such a fun time reading through them... many of the letters detail my mom and dad's courtship. I compiled all of them in chronological order in a scrapbook for my mother last Christmas. My parents are about to celebrate their 42nd wedding anniversary next month, so what a truly rare and *cool* thing to be able to read my mother's thoughts... long before I was one! My mom also laughs about how dramatic she was... always complaining about how hard school was and always needing money! Things to keep in mind while reading these - the mid-60's were obviously a different time. Women weren't allowed to wear pants on campus. Curfews were very strict. And uh, boys were obviously NEVER allowed in your dorm! She also didn't have a car. Home was in Montgomery, Alabama which is about 45 minutes from Auburn. Well that's on I-85... probably more like an hour plus back then! So to get home on a given weekend, she'd have to have my grandparents pick her up or catch a ride. Also making telephone calls was very expensive, so hand-written letters became her main way of communicating with her parents while at school. Anytime you see her mention "Bob" - that's my dad. There are several other boys' names throughout these letters - she apparently dated a lot! My mom was a Theta, so she mentions sorority life a good bit. Her roommate, Sandra, who she sometimes mentions, is still her best friend and my godmother. I have decided that I definitely want to come home next week and I'd love for you to come get me. I get through at 2, but there's this girl who wants to ride and she doesn't get through till 3, but I figure we could leave about 3:30. I hope Nanny can come too. It seems like everyone is going home next weekend. I had a great time last weekend. I don't remember if I told you but Fri. nite I had a date with this boy in my folk dancing class named Bob. He resembles Roland a lot. He's really a fine boy and I hope we can keep dating. I went to the game with Jim and to a fraternity party that Sat. nite. Bob wanted me to go out with him again Sat. nite (last) but of course I couldn't go. Carl came by Thursday night and wanted me to go to the library with him but I had a pledge meeting. He asked me out for Fri. nite but I couldn't go. As for school, so far so good. I got back my first real test today. It was in Reading Improvement and I got a 98. The teacher called me up to the desk after class and said, "Barbara, your paper was excellent. It was a joy to grade." Wish I could do that good on every subject. I almost never have a chance to sit down! Sorority keeps us so busy. Tomorrow nite we have "pledge swap," where we all date pledges from a certain fraternity - on a week night now! We'll go over to the house for dinner, etc. We had a meeting tonite and I didn't get home till 9:00. It's about 10 now. Thank goodness I don't have much homework. Today I had to clean up our Chapter room and I played volleyball at 5:00 until about 6:00 for our sorority team but we lost to the Tri Delts. Big Deal! All of this was of course outside going to 5 classes today and getting up at 5:30. Also, we are required to spend 10 hrs a week in the library. Oh well, so much for complaints. I still love it and wouldn't quit for anything. Y'all come Fri. afternoon and please get here by 2:30 OK? P.S. I may call you Thursday night. When my grandfather passed away we found letters he had kept that my mom (his daughter-in-law) had sent after she in my dad were married and my dad was in the Army, stationed in Fort Gordon, GA which is where I was born. It was really cool to read them and I know have them. 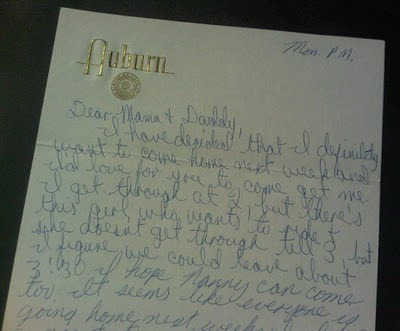 When my momma and her sister were in college my grandmother wrote them letters everyday. She turned those letters into a book for them. Love the things parents do for their children! How amazing! My grandmother kept all the letters my father sent her while he was stationed overseas I hope he lets us read them one day she won't without his permission. That is so fun! I bet your mom loved the scrapbook too! This was so much fun to read!!! thank you so so much for sharing!! I love this! Your mom is so cute. Such the in-demand date too. Adorable! What a great thing to have! I look forward to reading more of these - thanks for sharing! I just love these. I just read the one you posted the other day and went back for the rest of the story where you posted the link. I was hoping "Bob" turned out to be your dad! You are so lucky to have these.